(Phys.org)—A smart filter with a shape-shifting surface can separate oil and water using gravity alone, an advancement that could be useful in cleaning up environmental oil spills, among other applications, say its University of Michigan developers. The system could provide a more efficient way to remove crude oil from waterways without using additional chemical detergents, or even after detergents have been added, said Anish Tuteja, an assistant professor of materials science and engineering. Tuteja is the corresponding author of a paper on the research published in the Aug. 28 issue of Nature Communications. 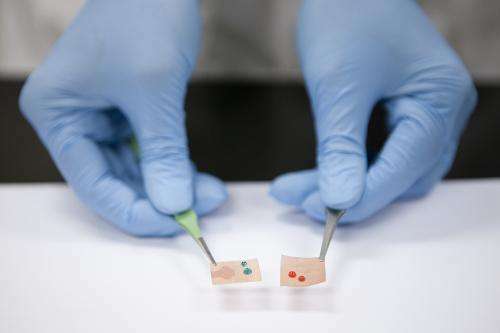 The researchers created a filter coating that repels oil but attracts water, bucking conventional materials' properties. Most natural substances soak up oil, and the few that repel it also repel water because water has a higher surface tension. "Our material operates in a counterintuitive way," Tuteja said. "Water spreads on its surface, while the oil beads up. It's hydrophilic, so it loves water, and oleophobic, so it hates oil." 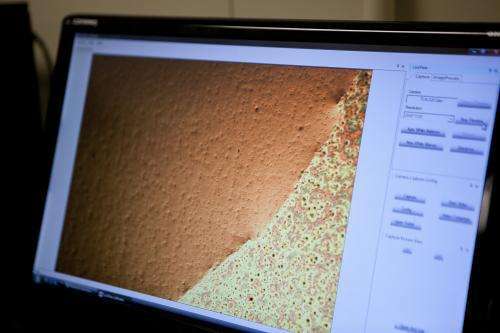 The new coating is a blend of a rubbery, commercially-available polymer and a novel nanoparticle. The polymer can readily form hydrogen bonds with water. The nanoparticle, developed by project collaborators at the Air Force Research Laboratory, is very low in surface energy and does not get wet by oil. In their experiments, the researchers dipped postage-stamp-size pieces of stainless steel window screen and polyester fabric into their solution. Then they cured the coated snippets under ultraviolet light. Meanwhile, they made four different types of oil/water mixtures, including emulsions with various ratios of water and canola oil. Emulsions, like mayonnaise, are mixtures of liquids that can be difficult to separate. When the researchers passed the mixtures through the coated filters, they found that with 99.9 percent efficiency, they could separate free oil and water, oil-in-water emulsions, water-in-oil emulsions, and any combination of these blends. "This is one of the cheapest and most energy efficient ways to separate oil and water mixtures," Tuteja said. "It has never been demonstrated before." "We've shown that, even when you add surfactants and dispersants to the mixture, as was done in the Deepwater Horizon oil spill, we can efficiently separate the oil from the water. The important thing is that we don't need any additional chemicals or high-pressure sources. We can do it with gravity alone." A smart filter with a shape-shifting surface can separate oil and water using gravity alone, an advancement that could be useful in cleaning up environmental oil spills, among other applications, say its University of Michigan developers. Tuteja says these results were at first surprising, and they're possible because of a particularly nifty property of the new coating. When it is exposed to water, the polymer and the nanoparticle components scamper into a different configuration—one that encourages the water molecules to bond with the polymer. "The polymer, in essence, reaches up during surface reconfiguration through the filter and wicks more water across, while the oil remains above the filter," said Arun Kota, a postdoctoral researcher in materials science and engineering and the first author of the paper. The coating creates a smart filter that lets only the water through. It accomplishes this by taking advantage of both gravity and the capillary action phenomenon that enables liquids to defy gravity in narrow enough spaces. It uniquely exploits differences in the capillary action behaviors of oil and water, the researchers said. They were able to use their coated filters for more than 100 hours without clogging—-a vast improvement over today's technology. In addition to oil-spill clean-up, the technology could be used in wastewater treatment, oil purification for fuel applications, and in the cosmetics industry. The work is funded by the Air Force Office of Scientific Research. The university is pursuing patent protection for the intellectual property, and is seeking commercialization partners to help bring the technology to market. The paper is titled, "Hygro-responsive membranes for effective oil-water separation." If this stuff works quickly and isn't too expensive to make somebody is going to make a lot of money on this one. The problem is that you're not going to find anyone willing to pay for a cleanup. next time there is an oil spill and there is the need to clean up, will this technology be widely deployed? absolutely not. it will probably be arbitrarily deemed illegal by the government for no apparent reason, the same way that substances end up on Schedule I. so, stop giving people false hope. every other day there are articles like "Water can now be sustainably split into hydrogen and oxygen" or "Artificial photosynthesis method is 100% as efficient as chlorophyll" or "Diet of buckyballs nearly doubles mammal lifespan." where is the real-world deployment of any of this?? all these technologies end up on shelves somewhere in warehouses, to be used after we're all dead, or perhaps never. so, stop giving people false hope. the next time there is a major oil spill, it will be left to dilute in the water by itself with the passage of time, as has been the case every previous time. humans are destructive and self-destructive.